In a dozen years of coaching -- 10 of those as the head coach of New Canaan boys swimming and diving team -- Dave Fine recalls some seasons in which he had conversations with the other members of the coaching staff about who would step up and fill voids left by graduates. Inevitably, the Rams manage to put out a strong squad year after year regardless of the amount of turnover. "The boys seem to surprise us at the end of the year," said Fine, who is keeping his fingers crossed for similar results this winter after a bulk of his postseason point-scorers were lost to graduation. 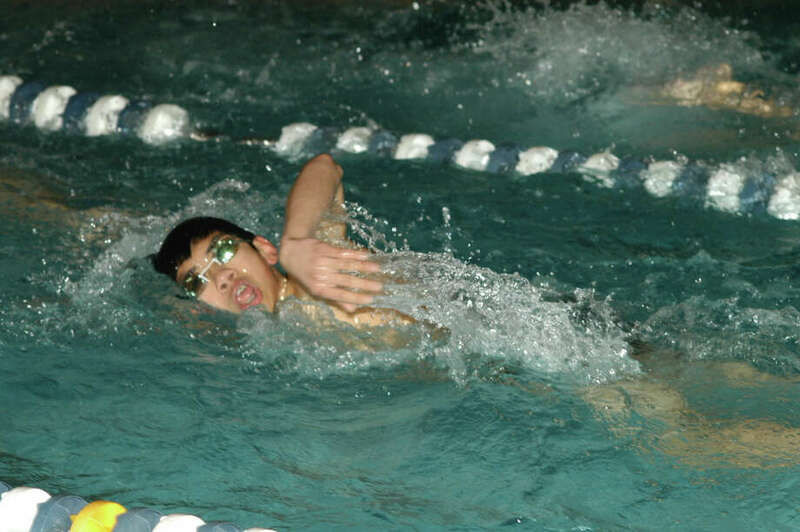 "I think there's a lot of talent in this water," he said during a preseason practice at the New Canaan YMCA. "We have a plethora of soon-to-be names. We're an extremely, extremely young group this year." The Rams were second in the FCIAC, runner up in the state class meet and sixth in the state open competition last winter. Fine is hopeful that his squad can again be among the best in the conference and state. "We can, by the end of the season, be a great team again. We can be competitive," the coach said. "I think they're ready for the challenge." Fine is confident the team's diving contingent will help carry it to success. "We definitely have the best diving in the state," said the coach, whose team had two freshmen divers among the top 10 in last year's Class M finals. Diver Tom Kalinowski, a sophomore, was second in the state last year. Fellow sophomore Griffin Edmonds was eighth. The diving group includes senior captain and All-American Bobby Ross, who won the FCIAC competition and is one of the best two divers in the state, if not the top diver in the state, according to Fine. Newcomers with diving experience are freshmen Cameron Rhind Emma Nolan. "I don't think I've had as strong a team in the 17 years I've done it," diving coach Joe Somma said. "When it comes to FCIACs and states we can score a lot points in diving that might make up for lack of the big gun in the 200 free or 500," said Fine, referring to areas that have voids following last year's graduation. With hard work we'll be there at the end of the season." The swimmers are led by senior captains Ned Hughes, a 100 yard breaststroker and 100 freestyle swimmer, and Stefan Pla, a versatile swimmer who can compete in a range of events including the 100 butterfly, 100 breaststroke, 200 individual medley, 200 free and 500. Another big scorer is Thomas Dunsan, who competed in some of the sprint events and the 100 backstroke a year ago. "There are going to be a bunch of guys that need to step up," said Hughes, adding that there is a lot of potential among the newer team members. "It should be a really interesting year. "My goals as a coach are for this team to always be as competitive as possible," Fine said.